Haider is a dark Bollywood film directed by Vishal Bhardwaj, Starring Shahid Kapoor, Tabu, Kay Kay Menon in lead roles. This movie will be the turning point in Shahid’s Career in Bollywood. Shahid is in a totally different role this time. He is different from his romantic actor image. He is perfect in his role and He is going to bag many awards this time. Only Vishal Bhardwaj can transform Saif Ali Khan into ‘Langda Tyagi’ and Shahid Kapoor into ‘Haider’. Haider is the best film of Shahid Kapoor and Vishal Bhardwaj till now. Shahid Kapoor is totally different this time and you will see some great acting skills by Shahid Kapoor. 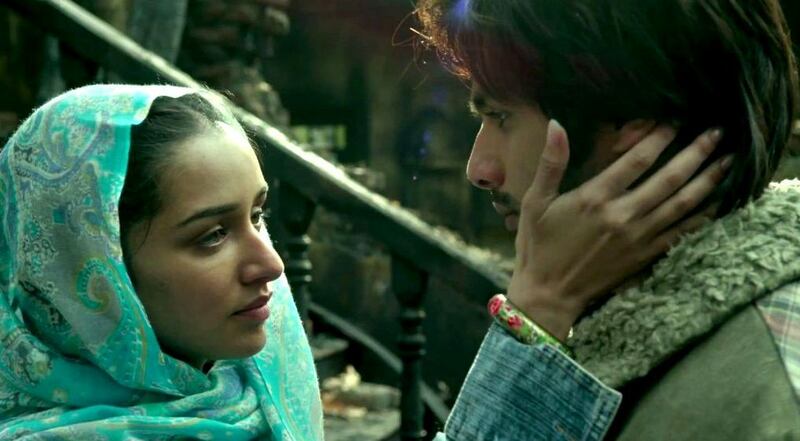 Screen share for Haider will improve after the WOM publicity. This film is not for Mass audience, it’s a serious film with mind blowing stuff. but if you love great direction, Acting then this film is for you. Shahid Kapoor , Tabu, Kay Kay Menon and small role of Irrfan Khan. Vishal, very brilliantly gave shraddha screen space, only which was needed. you may miss Sharaddha’s screen presence, but the story doesn’t need of demanding so. but all are brilliant at their work. The Story of Haider is not like other Bollywood films, Haider(Shahid Kapoor) is a student who came back to his home after his father went missing. Haider finds that his Mother(Tabu) and his Uncle(Kay Kay Menon) are in a relationship after his father Disappearance. He start searching for his father and he found that his Uncle is the killer of his father. His uncle betrayed his father for the relationship with his Mother. Then Haider finds himself in a bad situation, he is not mentally fit and he want revenge for his father’s death. We are not sharing the complete story for all twist and turns you have to watch the movie. Haider is one of the best Bollywood films ever, Haider is perfect and if you love quality cinema, then you should not miss this movie at any cost. May be you are planning for bang bang this weekend, but the Haider will give you some great ultimate experience of Film making and Quality. Haider is going to earn name and fame in the future and if it fails at the box office due to Bang Bang release then it will be a bad thing for Indian cinema. What’s Good- The whole movie is good, Songs, Locations and specially acting of all the starcast. Tabu is back in Bollywood with this film, Screenplay and direction and all the expects of film making are perfect. What’s Bad- I think first half of the movie was little slow but it was necessary for this kind of film. Yes, Watch this movie and You should not miss this movie and praise the great content given by Vishal Bhardwaj. Will I watch Haider again? Yes I would love to watch Haider again, for Shahid Kapoor and brilliant acting of all the starcast. Yes i am agree with You Nishant. Also adding that till now we thought anything about kashmir was totally based on View point of Indian Gov. but In this Film we can feel How Kashmiris are tortured and If they mistakenly became accused guilty then they had(dont know still) to suffer a lot. Na Jaane kitni peediya barbaad ki hai iss Intqaam ne aur na jane kab jake rukega ye sab..
same actor said Hindustan me bhi ajaadi Lathi wala hi laya tha bandook ajaadi nahi intqaam leti hai aur ajaadi ke liye pahle apne Intqaam se ajaad hona jaroori hai..
Movie is not about Kashmir it just based on Hamlet and Vishal Bhardwaj made it brilliantly with the Kashmir plot. Kashmiris suffers in all the problems no matter a Kashmiri is Hindu or Muslim.. Both suffers with the problem of Ind and Pak.